Scenes from the Menninger Foundation Professional Library. With the Menninger emphasis on treatment, training and research in mental health and illness, the library was an important resource for the staff. 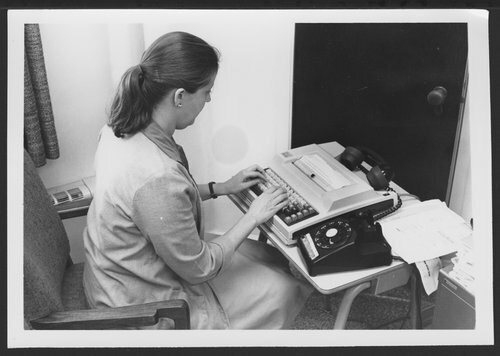 Menninger Foundation Professional Library, Topeka, Kansas - Alice Brand, Chief Librarian, is performing an early database search for information. The computer modem worked only through the telephone receiver.